Oooo I missed this one. Going to download for tomorrow's driving. Spoiler: Gandy having a haunted doll is (chef kissing fingers gesture) mwah! This is good stuff and those ending cliffhanger(s)! The mystery also feels like a mystery. I’m genuinely as invested in the minute to minute character interactions as the top level narrative. While I don't necessarily think that Travis GMing would/does produce better radio than Griffin doing it, I'd definitely rather play in his games than Griffin's. Griffin struggles so hard for perfection that can lose sight of the fact that a lot of what draws people to the podcast is family having fun. Travis is running this game more like a game and less like an experiment in narrative form. Actually I think Travis is producing better radio tbh. He lets people make their own moves and have their own conversations. I’m enjoying this arc a lot. And yknow I would listen to and enjoy a podcast where Griffin read stories that he wrote and had his brothers do voices but I would just want it to be in addition to this one and without the pretext that it’s supposed to be a game. I mean, letting conversations play out fully, that are happening because of choices the characters made, is fun to listen to. I think Griffin has a serious tendency to underestimate how long things will take to play out. This is a tendency a lot of GMs have, and one I have to struggle against myself. It's easy to prepare way too much content for a session, which isn't really a problem when it's part of a long campaign, but creates big problems in a short arc. In addition to this, Griffin seems a bit panicked by how successful the Adventure Zone has become, and really worried about letting the fans down by just letting the story be a simple contrivance that stuff happens on top of. I hope Griffin notices the positive feedback that Travis is getting about taking a less directive approach and takes it on board for anything he might be running in future. But, at the moment, I'd like to see Travis's GMing be given a chance in a longer form, not least because Griffin's tendency to take on far too many commitments seems to not be great for his ability to enjoy his work, which then impacts on the relaxed style that attracts people to the McElroys in the first place. The one thing I like the most about Griffin being the GM is everything integrates better since he's also the one producing the show. He edits it and adds music and makes all the little touches that made the Balance arc such great storytelling. I'm sure it's possible to get the same results with Travis as GM and Griffin producing, but that will require a great deal of collaboration. It's possible, but is it worth asking from these guys doing a free podcast that's ostensibly for fun? This was also my biggest bummer with Clint's arc, it didn't feel as smoothly integrated because Clint was running the game but not running the podcast. 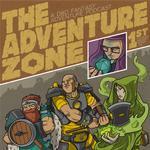 It's not bad, but it's certainly not the same as the rest of The Adventure Zone. This isn't to say I think Griffin should continue being the GM forever, I'm digging Travis as well, especially his willingness to let the game develop as it will. I imagine if Griffin were running the game he would have two plotted out endings, one for if they figure it out and one for if they don't, but it really does seem like Travis is just going to let the game do what it wants to do. I was kind of hoping Travis was just going to play a hand of poker against Clint there. I'm really enjoying this arc; Travis has a great approach - he's laid back in terms of what the characters are doing, and yet he's done enough work that he can respond in a meaningful way to whatever direction the players choose. I have the sense that he's fleshed out the town enough that he can respond well, but not so rigidly that the "solution" depends on the players going to the right place at the right time; he can salt in the hints and clues wherever needed. And he may not have any particular "solution" in mind; he can see what the players pick up on, and then use further hints and clues to help confirm what they are seeing; that way, the case gets solved. I think Travis leans harder on backstory and less on plot and Griffin is the opposite. He seems to have tons of character notes and more in his pocket, but the active plot is murder details and everyone else in town is hanging out or sleeping. I think it makes for a more playful experience, and lets ongoing root beer shenanigans build and be funny and natural. He does seem to have tons of notes in his pocket, but unlike Griffin, he doesn't feel the need to make sure they all get used. The pain of the DM at times is crafting wonderful little characters or moments, only to have the players slide right by them...Travis seems ok with that happening, whereas I've always felt that Griffin excels at creating wonderful, amazing, scripted moments that drive things towards making sure the players have those experiences. It’s funny how all of this seems to match up with their personalities so well too. Like I notice on mbmbam that Travis is remarkably easy going when Griffin or Justin are making jokes at his expense or how he always swoops in with a pun knowing it’s not going to be appreciated. As the middlest he really just lets everything go and it’s great, it works so well for them and it’s really pleasant to listen to. Just like yeah that’s fine. There is so little of that easygoing-ness around. Yeah its interesting. I think there were points where Griffin would have helped the players out where Travis doesn't really. In the 5 questions scene Clint asked for his last question something which had already been answered. Later, when Ann revealed she had married the deceased fang, I really expected some more curiosity: who married them? Why was it a secret? I feel like Travis might have expected that too. Instead he stayed focused on the whole deal thing, and Travis let him do so. I think there were points where Griffin would have helped the players out where Travis doesn't really. This is a really good point and part of why I like this arc: it feels like they might not actually solve the mystery. Because the very existence of the entire universe isn't at stake failure is not only an option but potentially the more interesting option for future storytelling. Also, no episode this week but two next week. I'd really like to see the brothers do a game set in the Over The Edge universe. The system emphasizes story-telling over dice rolling and has a cool open backstory.